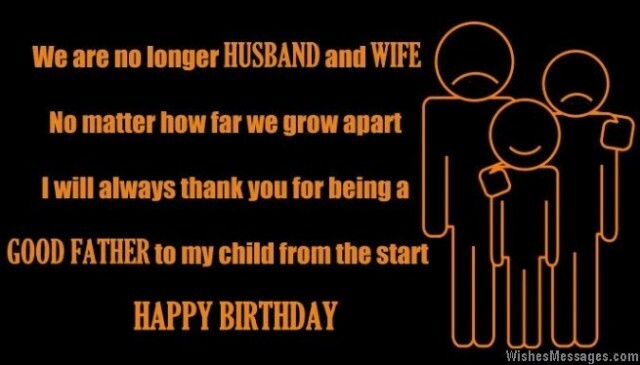 Birthday wishes for ex-husband: What will you say to your ex-husband to wish him a Happy Birthday? Take ideas from these quotes and messages to write something sweet on your ex-husband’s birthday card if you want to start building bridges. Your cute text message or a funny Facebook post may be the beginning of an amicable friendship with your ex. For the sake of your children and the fact that he is the father of your kids, if you think that his birthday is your chance to at least be on talking terms, send him a greeting. As his ex-wife, show him that you have moved on in a mature way after broken marriage and divorce. 1) I hope that the sweetness of this message slowly overpowers the bitterness of our divorce. Happy birthday to my ex-husband. 2) We may have given up on our marriage, but let us not give up on its memories. Happy birthday to my ex. 3) Just because our marriage did not work out well, does not mean that I don’t wish you well. Happy birthday. 4) We are no longer husband and wife but no matter how far we grow apart, I will always thank you for being a good father to my children from the start. Happy birthday to my ex-husband. 5) The father of my own kids can never be my foe. Happy birthday. 6) For the sake of our kids, let’s promise each other that we will not let our bitter past affect the possibility of an amicable future. Happy birthday. 7) You became my boyfriend, then my fiancé and later my husband. Life has come around a full circle as you are now just a friend again. Happy birthday. 8) Our divorce was like a raging rapid which has separated us. But let us try to build a bridge which allows our children to cross over to both sides any time they want. Happy birthday to my ex hubby. 9) I wish life had a Rewind button. I would Rewind back to the time when we were just friends before our marriage and press Pause so that we would have been friends forever, and lovers never. Happy birthday to my ex. 10) The way you have supported your wife and children after divorce shows that you may have changed as a person, but you still have a generous heart. Happy to my ex-husband. 11) If I could use CUT and PASTE in real life, I would CUT you from my life as an ex-husband and PASTE you as a friend. Happy birthday. 12) We are no longer husband and wife, but you will always be a part of my life. Happy birthday. 13) Our children may not get to see their parents have a healthy married life, but the least we can do is show them that people can still get along for the sake of their loved ones. Happy birthday to my ex. 14) Our divorce was the worst experience of my life but I want you to know that I will always cherish the wonderful moments of our marriage in my heart forever. Happy birthday to my ex-husband. 15) As your ex-wife, I have no right to interfere in your personal life. But I hope that I still have the right to wish you well on your birthday. Happy birthday. 16) We both have moved on and gone our separate ways, but I cannot forget the birthday of a man who I used to call husband one day. Happy birthday to my ex. 17) It is a pity that I need to add EX before referring to you as my husband, but at least we are still on healthy talking terms. Happy birthday. 18) Life is too short to have regrets – we may not be able to change what happened, but that shouldn’t stop us from being each others’ well wishers. Happy birthday to my ex. 19) It feels strange to wish my ex-husband on his birthday, but I am taking it as a sign that we have both moved on from the past. Have a good one. 20) Immature decisions may have plagued our marriage but we can still be mature enough to be supportive exes. Happy birthday. 21) Just like how I never unfriended you on Facebook and never stopped following you on Twitter, even after our divorce I will not stop wishing you on your birthday. Have a great day. 22) Despite our differences, let’s be friends and give our children an important lesson – even life’s worst adversities have a silver lining. Happy birthday to my ex-husband. 23) You may not have expected your ex-wife to send you a birthday greeting but life has many weird surprises, just like how I never expected to be your ex in the first place. Happy birthday. 24) Despite the fights, despite the legal battles, the father of my children deserves a warm greeting on his birthday. Hope you have a great day, happy birthday. 25) As my ex-husband, you were and you will always be a part of my life, and I will forever respect that. Happy birthday. 26) We will never be together again, but I hope we can be friends and ease our divorce’s pain. Happy birthday to my ex. 27) If all ex-husbands were as supportive as you, all single mothers would be as lucky as me. Happy birthday. 28) We could never tolerate each other as husband and wife, but I am glad that we both have moved on in our lives like mature exes. Happy birthday. 29) Just because you are my EX, doesn’t mean I will cross out all our memories with an X. Happy birthday. 30) I lost a husband in you after our divorce, but I have found a new friend. Happy birthday.